We're at the end of the first week of +Andy Andres' SABR101x course, offered through +edX. Having completed the materials, I thought I'd share a few reflections. makes courses on edX work. This is my first edX course, but I don't think it will be my last. I'm pretty impressed with it as a platform. It strikes me as an excellent learning platform, with the ability to deliver a tightly organized course that presents information in multiple ways. Furthermore, it allows students to interact with assessments via multiple choice-style questions as well as text entry, and to interact with each other via targeted discussion boards that can be inserted into specific stopping points within lectures. I'm a college professor in my day job. I teach brick-and-mortar classes, and have avoided digging into the realm of online classes. One of the things that I'll be doing is taking a look at how the course is constructed, both in terms of information progression as well as the mechanics of how Andres presents the material. There's a lot to like, here. The lectures are presented in short video format that usually runs 5-13 minutes in length. In between, there are at least a few quick assessment questions, which gives students a chance to think about and process what they've just learned. And intermixed with the lectures are short, 1-2 page written explanations that complement, but are not redundant with, the lecture material. One thing that I didn't anticipate was how much I like having the narration to go along with the video/audio. As a learner, I know that I do best when I can both see and hear something. But, aside from video games, it's rare that I've had the chance to watch and listen to a narrative at the same time. I can tell that I can grasp concepts much better when getting to read and see at the same time. I don't plan to turn on the substitles on my home TV any time soon, but it's great for an education setting. Along the way, I'm keeping a google doc window open where I can take notes as well. As a side note, reading the narration allows for fun little quirks. I feel bad for whoever they had transcribing all of the words, as that doesn't seem like a fun job. But watching them try to spell Voros McCracken's name was funny ("Vhoorees," I think?). This week began with a basic introduction to sabermetrics. Andres started exactly where I tend to start most of my courses: by defining terms. He spent a lot of time looking at dictionary definitions, as well as definitions from those in the disciplines covered here: sabermetrics, statistics, data science, and big data. These kinds of discussions always seem a little bit laborious. But at the same time, they provide the opportunity to dispel a lot of misconceptions. They also help enforce the idea what we need to be precise with our language. I found the definitions when discussing databases to be particularly helpful, because I have very little background in that area. Beyond definitions, this week was pretty light in content. We took our first stab at running some MySQL queries in the BUx SQL Sandbox that Andres and his team set up on edX, and it worked well enough. They set up a Lahman database and got everything set so that users needed only to type in the queries as presented in order to retrieve their data. There is no inherent need to set up one's own SQL server/workbench to complete the course (although I did just that; see below). Assessment thus far has been pretty light. Some of the questions have been recall of minutia. For example, one of the first questions asks you to report the year in which Bill James coined the term sabermetrics. Good grief. :) But most answers have been readily apparent from the videos, if one is paying attention & taking at least light notes. Coding submissions are graded based on the output MySQL server stemming from your query, as far as I can tell. So far, the coding assignments have basically been copy-and-paste exercises that require almost nothing from the student. Still, a glance at the discussions shows that students are still having trouble with this. Therefore, basic practice in syntax and input is probably appropriate at this stage of the course. Future modules will almost certainly require a bit more thought in the assessment sections. 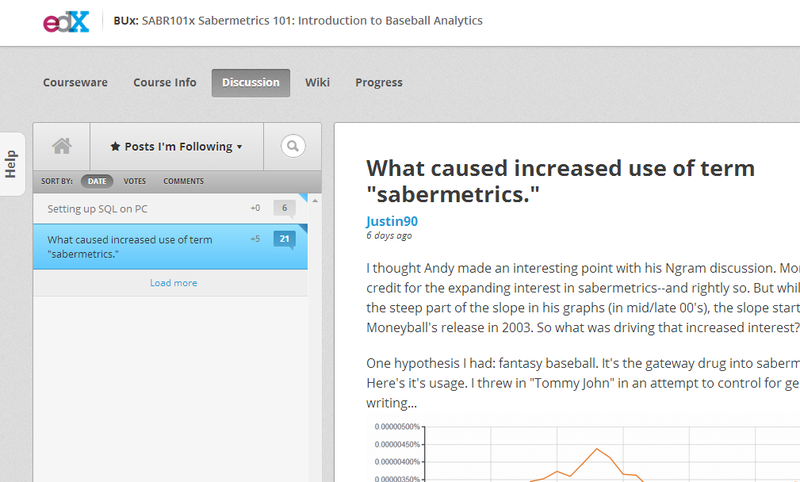 There is also a History of Sabermetrics track in the course. This week's focus was on Henry Chadwick. Chadwick is sometimes known as the Father of Baseball, and is sometimes mentioned as an early pioneer of baseball in the same breath as Abner Doubleday (who, for a moment, was confused in my mind with Albus Dumbledore! Go figure!). But, as Andres notes, he was also the first real sabermetrician. While he might not have actually invented box scores, he established a careful approach to observing, recording event, and the reporting on games that was pioneering. He also was instrumental in carefully recording and refining the rules of the game. Furthermore, through his writing in newspapers and his books on baseball, he was instrumental in publicizing and popularizing reports of baseball. He's a guy that I've read a bit about before, most notably in Alan Swartz's Number's Game (which I read close to a decade ago! 'Tis a bit fuzzy). Nevertheless, I found it a neat little foray into baseball history to learn more about him. I'm looking forward to more of these history segments. usability advantages over running from the course sandbox. In order to get more practice, and to be set up to work on my own, I did opt to get a MySQL server running on my own computer. I went to MySQL's website and downloaded their installer for "MySQL on Windows." It was pretty easy to set up, although there was one hiccup where a certain "ODBC Connector" file (whatever that is) was not found by the installer and I had to download and install it manually. Once installed, I launched the program and s elected Database-->Connect to Database from the menu. That launched the workbench, which gave options to "Startup/Shutdown" the server. Once started, my next step was to install the Lahman database (Andres provided a specific one to users of the site--they apparently made some changes? There were two files...I went ahead and installed both as a SABR_101x schema in MySQL, seems ok!). Now, I'm set to run queries! Everything that works in the course works on my rig, although mine was installed such that all table names are lowercase. There's an option in the server settings to not do that, but things were getting screwy when I changed that. So...I'm just going to remember that this is a difference between the course and my computer. I actually prefer this, because tables are not case sensitive on my system. But I'm sure I'll get a few submissions wrong in the course as a result! The interface of this workbench is light-years nicer than what I used when following Colin Wyers' instructions some years ago to install the Essentials SQL server/workbench. There are options to save queries as script files, which is huge. As you're editing, the editor color-codes commands, and offers pop-up help whenever you put your cursor on specific functions or operators. I also love the schema view: you can select multiple columns in a table--or even multiple tables--with your mouse, right click, and it will automatically add the appropriate bare-bones SELECT text. It's very nice. That's all I have for now. If you're on the edX course, I'm going by Justin90 there. Please feel free to say "hi" if you see me on the forums. Or, of course, just chime in here!